Vision Series Test is one of the helmets in the latest range from Masuri featuring superior air flow ventilation. The Vision Series Test is built for a high level of impact, protection and comfort. Strategically-placed vents in the inner and outer shells improve air flow, and the new reinforced rim (HRS) minimises movement between the solid peak and the certified steel or titanium bar grille, giving the Vision Series Test strong protection performance. The Vision Series Test model grille uses certified grade 5 titanium or high grade stainless steel. It also incorporates advanced manufacturing techniques to give greater protection. Masuris Halo Reinforcement System (HRS) is an extra strength helmet rim featured on every model in the Vision Series. 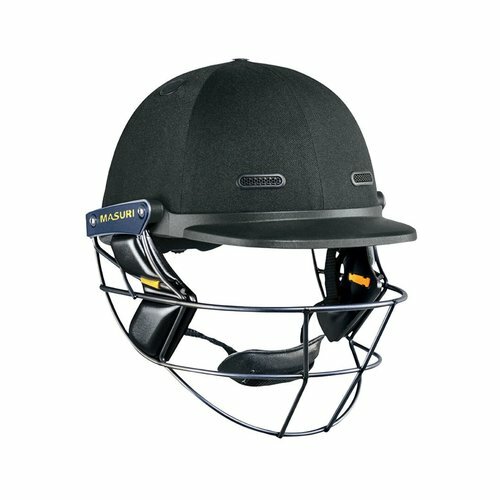 Made from the latest reinforced plastics, HRS ensures our cricket helmets have the brawn to protect the wearer from a ball delivered at 90MPH. The innovative 3-layer protection system incorporates strategically placed vents in the inner and outer shells and air channels throughout the cavity, allowing air to circulate freely at all times, keeping the wearer cool.